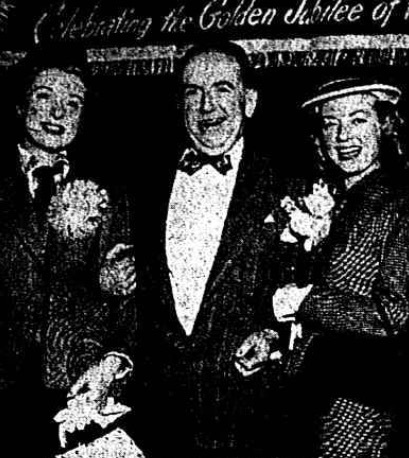 Hugh Donlon shown here escorting Hollywood starlets Audrey Totter on the left and Greer Garson on right during their 1952 visit to the Amsterdam. How good a writer was the late Amsterdam historian, reporter and columnist, Hugh Donlon? One way to answer that question is to point out that his “Main Street” column is still appearing regularly in our local newspaper and the guy’s been dead for 25 years! He may have been born on April Fools Day in 1896 but this talented scribe was anything but foolish. He joined the Recorder staff in 1930. By then Donlon had lost his first wife Teresa, who had died during the delivery of their son in 1921 and he had remarried and become the father of three more boys. You can read the rest of my story about this illustrious Amsterdam journalist in my new book “A Year’s Worth of Amsterdam Birthdays.” To order your copy, click here.